All people from 7 to 77 will enjoy this very entertaining family game. This 12′ deluxe model is solidly built, with molded corners, solid oak handrail caps and built-in scoreboard in the rails. 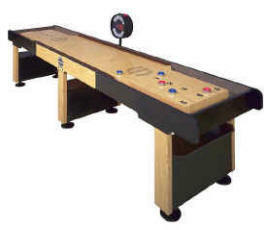 The laminated surface is made to withstand the most intensive type of game played on it.